A father and daughter watch the Queen's Lifeguards marching through the city, as they do every day, on their way to the changing of the guard at the palace. They're sitting in/on their Triobike. They are really gaining in popularity in Copenhagen. 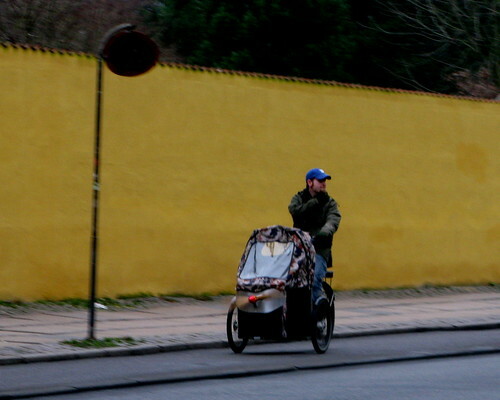 A Nihola rolling along Nørrebrogade. With a little accessory on the front - a propeller that spins happily. Here's me guessing that it's for the pleasure of the kids who ride in the Nihola. 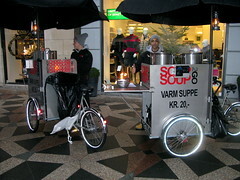 Custom-made soup and hot chocolate vending bikes on Amager Square. 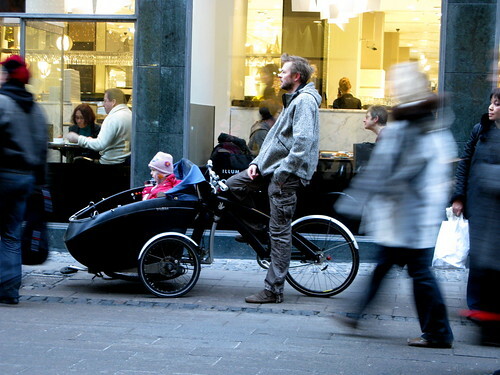 The past year has seen an explosion of custom bikes for selling goods on the streets here in Copenhagen. The City relaxed the rules about vendors and that really opened up the streets to creative bike designs - and it's a plus for creating a vibrant city. 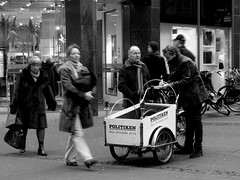 One of the national newspapers sell subscriptions from a Christiania bike on the busy pedestrian street Strøget.